A riflescope can greatly improve your aim when shooting at targets from long range. However, if you don’t know how to mount your riflescope properly, even the best sighting equipment won’t be of any help. The truth is that scope-mounting systems are the weakest link in any shooting system. So, in this post, I’ll be sharing with you a few tips on how to mount a scope properly. With these tips, you can rest assured that everything is properly tightened, the reticle is dead level, and the eye relief is correct during your next hunting spree. Before proceeding, it’s also important to match rings and bases. Most, if not all, modern rifles come with pre-drilled screw holes for attaching scopes. Depending on the brand, some scope bases will only fit specific rifles. Therefore, make sure to check whether the mounting attachments are compatible with your rifle. By checking the bases and rings visually and pre-fitting them, you can tell whether they’re of the right height and diameter for your rifle. Once you have the proper rings and bases, the first step is to mount the base. Begin by clamping down the barrel in the vise, but make sure to pad the jaws to prevent the vise from scratching the metal. Next, wipe dry and apply rust preventative oil on the attaching surfaces then place the scope’s bases on the rifle’s mounting positions. The front and rear base may be different on some mounting systems, so make sure to check that you’re not attaching them backward. Now, tighten the screws that hold the base secure to prevent it from wiggling loose. Most scope manufacturers recommend a maximum torque for tightening base screws so be sure to follow these guidelines when mounting the base if you have a torque wrench. If you don’t have a torque driver, then you’ll have to go by the feel of resistance when tightening the screws. Ideally, the screws should be tight enough so that the base doesn’t move under recoil stress. For maximum stability, you can apply a thread freezing compound like Loctite on the screws. After the base is secured, attach lower halves of the front and back rings before screwing them into place. Avoid using your scope to measure ring alignment. Instead, use a ring alignment tool for this purpose. Two wooden dowels or metal rods with pointed ends and of similar diameter to your scope would work just fine. You’ll know that the rings are in alignment when the pointed ends of each dowel or metal rod appear to be leveled when they’re almost touching. Next, remove the dowels and place the scope in the bottom ring halves. Gently screw on the top ring halves, leaving enough room for the scope to rotate and move back and forth. If you notice any uneven contacts between the scope tube and rings, you can try to rotate one ring. If that still doesn’t result in a perfect alignment, then lap the rings. Lapping, or polishing the inside of scope rings, ensures maximum scope-to-ring contact besides removing any sharp edges that can scratch the tube of your sighting device. With the scope properly mounted between the bottom and top rings, the next step is to align your sights. To do that, unclamp your rifle from the vise and remove its bolt if possible. Bring the rifle to eye level and look through the scope while moving it back and forward until you have proper eye relief and can see the field of view completely. To prevent bumping your eye on the eyepiece during recoil, move the scope an inch further forward. Now, turn the eyepiece until the reticle appears in the ocular field. Align the crosshairs by turning the windage and elevation turrets while viewing an object such a vertical and horizontal mark on the wall. You can also insert a bore sight into your rifle’s muzzle to adjust the vertical and horizontal axis to your desired point of aim. Keep in mind that bore sighting only aligns your iron sights on paper at 100 yards. Therefore, you’ll need to fire test groups to sight your rifle properly for longer distances. Finally, double-check the scope’s position and sights. If you’re satisfied with the reticle’s position as well as the scope’s alignment with the rifle barrel, then tighten the top ring screws. Once the scope has been mounted securely, just bore sight it again to fine-tune the crosshairs and you’re ready to fire. Remember to check the tightness of your ring screws occasionally to ensure a successful hunt. Now that you have your AR 15, the next step would be to improve your accuracy by getting a rifle scope. But, even with a great AR 15 and a superb scope, you also have to choose among the many scope mounts for AR-15 available on the market. Without the proper mounting, even the perfect scope for your well-cared for AR-15 won’t let you shoot successfully. The point of the mount is to make the scope remains in place, no matter what happens. The mount should be suitable for your AR-15, and it should also be right for the scope you want to get. And, since scope mounts for AR-15 are the “weak link” in your shooting system, you may want to get a qualified gunsmith to make sure that it’s properly installed. Do you plan to use the scope mount on just a single weapon? If you answer yes here, then a fixed mount is your best option. It will help keep your scope stable and sturdy. With a scope that’s permanently affixed. You also won’t risk damaging your scope when you move the scope from one rifle to next. • Dovetail scope mount. The mounting system of rings and base has a wedge (called the dovetail) on the bottom half of each ring. It inserts into the base and enables the scope to turn 90 degrees. This mount may be a bit too heavy for the AR 15, but there’s a new version called a dual dovetail, which can really stand up to hard recoil. • Universal scope mount. This system isn’t as sturdy as the dual dovetail, but you can use it for many different types of firearms. Do you have lots of guns, but don’t want to buy a separate mount for each one? • Weaver style scope mount. The most popular option in this category. It allows the scope to be removed while the mount is still attached to the gun. That means you can always remove the scope anytime you want. You can remove the scope when you’re travelling, when you want to clean it, when you want to use the scope on another gun, or you want to use another scope on your AR 15. • Picatinny style scope mount. It’s similar to the Weaver system, but the Picatinny system has wider base slots. You can’t use Picatinny rings on a Weaver base, but you can use Weaver rings on a Picatinny base. • Clamp-on mounts. These are very easy to use. They can even work on a gun that has been pre-drilled for scope mounts. They are also easy to remove without damaging the gun or the scope. How high is the scope mount? Here you want to make sure that it clears the iron sights so you get a clear view of your target. A lot of AR 15s come with fixed A2 front sights despite the fact that most of us put scopes or reflex sights on them. But if the mount is high enough, then the line of sight of the scope won’t be impeded by the front sights. Does it have enough slots for scope ring adjustments? A very important feature that you should check before getting your mount. Does the design allow you to use AR 15’s front sight? Some scope mounts are designed with a peep sight that allows you to use the front sight as well. While sticking to a budget is important, what’s more important is to remember that with scope mounts, price and quality tend to match. You truly get what you paid for. So it doesn’t make sense to get an expensive scope and then try to get a cheap mount to go with it. While many rings and mounting equipment have come and gone, Nikon has been offering a high-quality line of mounts for the best customer experience. With the arrival of the Nikon P-Series mount, their range of quality products has expanded even more. 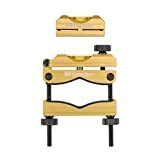 This 2-piece design mount allows proper mounting height and proper fore-aft positioning for proper shooting technique with comfortable eye relief. 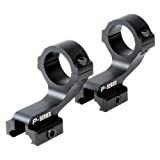 The Nikon P-Series Mount is an interesting choice for those who need a reliable mount for their optics. The not so many negative reviews are overpowered by the praises and appreciation it has garnered so far, and could perhaps be treated as isolated cases which do not really say anything regarding the product’s quality. Ease of use and installation have been lauded as this specific model’s strong points, while its lightweight metal finish has been the subject of some debates regarding compatibility as well as durability. Overall, the Nikon P-series mount is definitely worth considering. Finding a decent tactical laser equipped flashlight to suit your needs can be quite a problem due to the fairly limited options available. It is a good thing that there has been a surge of viable options recently, one of them being UTG 2-in-1 Tactical LED Flashlight with Red Laser, which has attracted mixed reviews, but still serves its purpose as a dependable add-on for your handgun, for whatever purposes it may serve. What features make it stand out from the rest? Let’s find out. → CR123A lithium batteries provide 2 hours of battery life. √ Bright flashlight could light up an entire dark room. χ Laser failing to work after just a few days of use. In summation, you might be able to find another viable alternative which may be a bit more costly but could withstand recoil related pressures which should be of primary consideration for products like this. Not to mention how a handgun or a pistol would not really pack in that much pressure. However, the UTG 2-in-1 Tactical LED Flashlight with Red Laser is still worth considering thanks to its rather affordable price tag. If you’re looking for an affordable tactical LED flashlight, this one is a good choice. When it comes to rifle accessories, you can count on Monstrum Tactical to deliver the best variety of products you would ever get your hands on. With the arrival of the AR-15 Detachable Carry Handle with Rail Mount Package, you could rest assured that everything you need for your rifle to function above expectations could be found with this equipment. In any case, it is still worth weighing in on various pros and cons as far as features are concerned in order to make sure that you are getting your money’s worth. √ Compatibility with Picatinny rails means stronger hold and easy adjustment. χ Rear sight assembly breaks easily. Despite some of the negative feedback, the AR-15 Detachable Carry Handle with Rail Mount Package is still a good choice for those looking for a functional and sleek looking carry handle. Most buyers have given it a 5-star rating on Amazon and we’re pretty sure you’ll be happy with it too. When it comes to tactical gun equipment and add-ons, Streamlight has been a reliable source of a wide range of products, with their very own version of Laser Sight Rail Mounted Weapon Flashlight as the latest addition to their offerings. Packed with added features that are sure to tickle your fancy, this new generation flashlight will prove to be useful during your hunting adventures in the dark. Nonetheless, it is still worth evaluating whether this product lives up to the hype or if it’s just all buzz. → Powered by C4 LED technology which renders it shock-proof. √ Enhanced compatibility with rail attachments. With such high tech features, one would think that this model would be devoid of any negative feedback, and this is true to some extent as far as functionality is concerned. Aside from the relatively more expensive price tag attached to its name, there have also been some complaints regarding the light itself, with some issue being raised on its durability. There have been reports of lights, as well as lasers, failing, although these could easily be dismissed as factory defects. Streamlight’s decision to market its new 69120 TLR-2 C4 LED model as a laser-sight rail mounted weapon flashlight paid off given the rather overwhelming positive feedback. In terms of performance and design, the Laser Sight Rail Mounted Weapon Flashlight without doubt will make every handgun owner out there happy. Are you aware of the shooting phenomenon known as cant? This is when you tilt your rifle to the left or to the right. Many shooters may not even know that they have this problem. And when they do recognize it, they mistakenly think that it’s not really a big deal. Even a tilt of just a few degrees can affect your shot. Your shots will tend to impact low, and they will also veer to the side where you are canting. Now there are several ways of correcting this problem. One way is to use a known vertical or horizontal feature and to align the cross hairs with this feature. If you are using a post, for example, then the vertical cross hair must align perfectly with the post. This is an important thing to remember, especially when using a rock or a tree for a steady support. These natural features are rarely level. But an easier solution is to simply buy the Vortex Optics Riflescope Bubble Level. It’s cheap, it helps shooters keep the rifle level, and it helps bullets shoot true. The working principle of the Vortex Optics Riflescope Bubble Level for 1in Riflescope Tube BL1 is easy enough to figure out. This device has a very easy to see bubble, and this can indicate whether or not you are holding your rifle level. It’s such a simple device, yet the benefits are amazing. It can really tighten up a shooter’s groups. Its placement is also very convenient, as it does not mess with adjusting or sight acquisition. 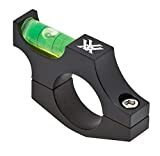 All in all, for those who tend to tilt their rifles without even being aware of it, this device is a godsend. As for the negatives, shooters have to know how to set up, adjust, and take care of the device properly. Once they know how to do all these things, then nothing could go wrong. This is almost a “must buy” device for everyone who uses a rifle. Even those who aren’t able to use it properly are at the very least made aware every time of the importance of keeping the rifle level. Such awareness alone is worth the price of the Vortex Optics Riflescope Bubble Level for 1in Riflescope Tube BL1. In the old (pre-Wheeler Professional Reticle Leveling System) days, mounting a scope was a big production. The old way was to first set a rifle to level it out. Back then the scope was placed in the rings, and the shooter used their eye to level the horizontal bar of the reticle. The shooter would adjust the vertical component, until it was properly perpendicular to the axis of the rifle. This method was effective most of the time, but not always. It also took a lot of time and effort. Nowadays, there are some fairly affordable reticle-leveling systems available. But for professionals who mount scopes for customers, a much more effective system is needed. That’s where the Wheeler Professional Reticle Leveling System comes in. The Wheeler Professional Reticle Leveling System is probably the most effective tool that can be used to align a scope precisely. It’s made from anodized aluminum, and it comes with factory adjusted calibration set screws, aluminum level housings, Computer Numeric Control machined aluminum level housings, and a protective molded case. It also comes with an easy to understand and implement instructions. This system can be used for just about any type of firearm. The list includes falling block action (aka dropping-block or sliding-block), bolt action, pump action or semi-autos, including AR platforms. This is probably one of those tools that when used, people can’t tolerate anything less afterwards. The Wheeler Professional Reticle Leveling System is a supreme example of a tool that helps people mount a scope correctly. With this instrument, leveling out the reticle on a new scope takes an astonishingly short amount of time. The instructions are quite easy to follow as well. Of course, the bad news here is the price. But for those who tend to mount scopes regularly such as gunsmiths and dealers, this tool is priceless. It may even be a worthy investment for those who have bought expensive scopes, since mounting such a scope incorrectly renders them virtually useless. Some people simply want the best, but others need the best. When it comes to mounting a scope, some people who do it regularly for their customers have to make sure that they’re doing it right—and that they’re doing it quickly too. With this system, they can be sure that they’re mounting a scope correctly. When it comes to quickly setting up a scope for maximum precision, there’s probably no other system out there that can match the excellence of the Wheeler Professional Reticle Leveling System. It’s that good.